There are several different species of dragonflies in one of the fields that I frequently visit. 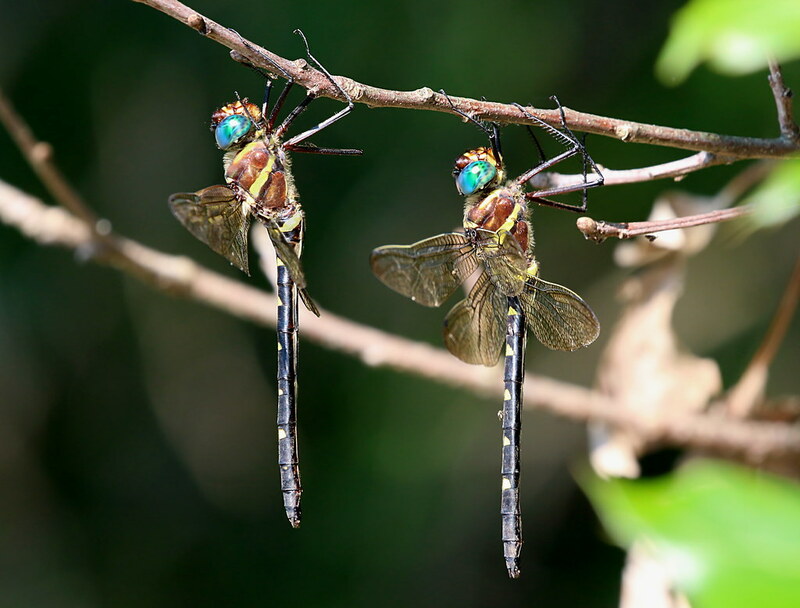 Among them were "mystery dragonflies" that were always on patrol. You know the kind: they never land! But one day one of them flew past me, and after some inspection of a forest edge, it actually settled onto a twig far down the trail. I hurried over to take a look, and I saw this wondrous sight. 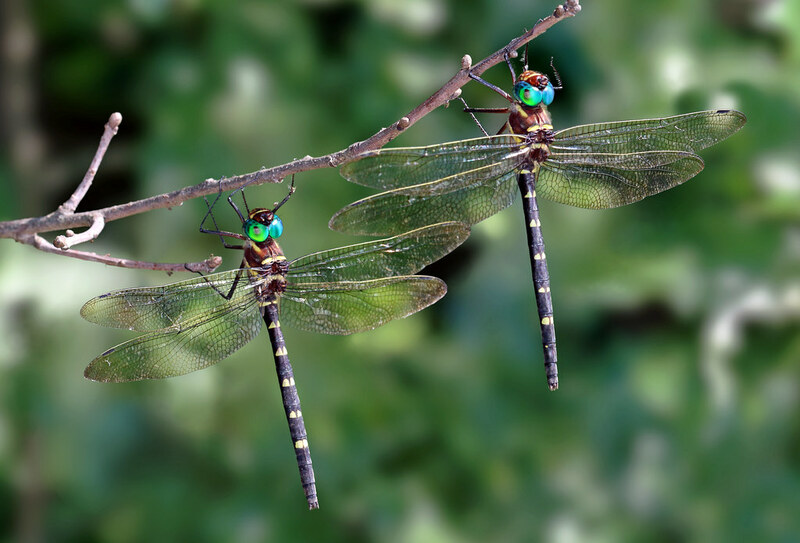 Two of the dragonflies! Both females. I later identified them as one of the "cruisers". Identifying them proved challenging and I had initially mis-labelled them as swift river cruisers. 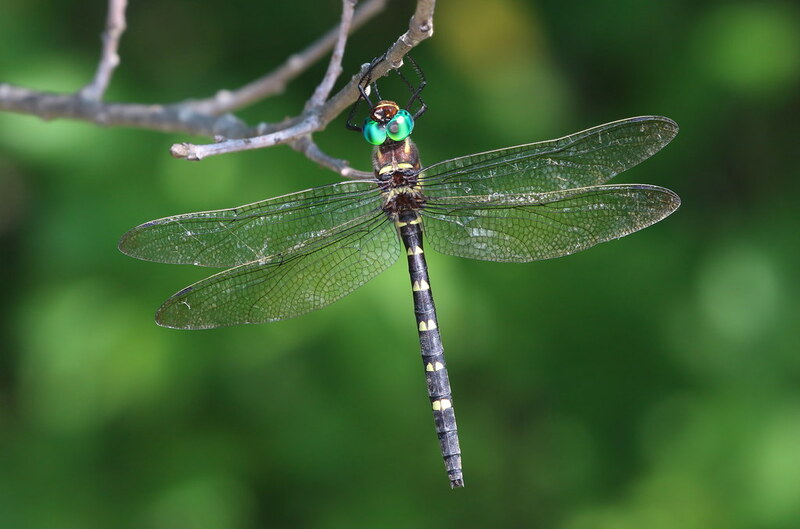 But that was more recently revised after submitting their pictures to Odonata central (a place where experts track the distribution of Odonates). Several of the experts got involved, and after many e-mails back and forth among them the consensus was that these are are royal river cruisers (Macromia taeniolata). Photographing them was pretty amazing. They were content to stay in the area. One would sometimes fly up to a higher perch, but it would soon return to land next to its partner. Social behavior? I have no idea. You can see several tiny flies that were hanging out on them in some of the pictures. 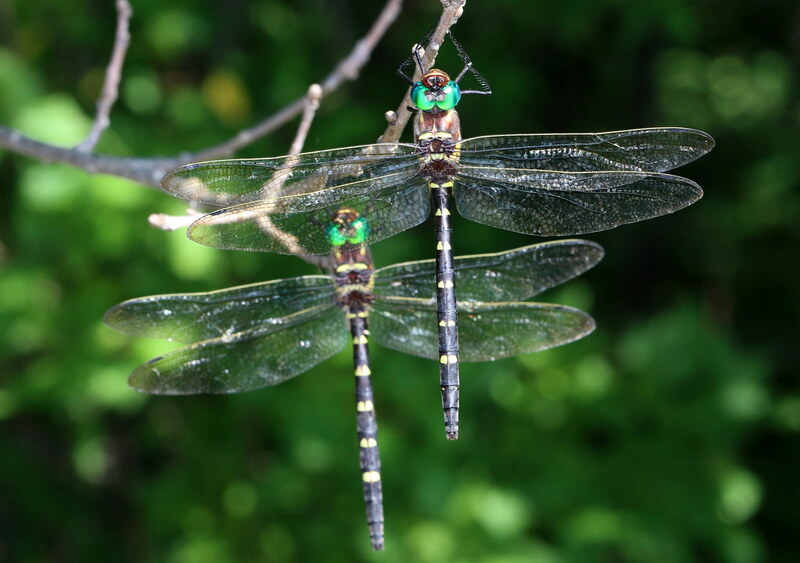 The dragonflies would occasionally shiver to shake them off, but they would soon return. In the last picture I extensively edited the background by using layer masking (for the first time) to isolate the subjects from the background so that the background could be substantially blurred. I even masked out the wing membranes while leaving the wing veins behind. All the spines on the legs and a lot of the dense body hairs had to be painted back in with various tools in photoshop. It took time! You can inspect this more closely on the Flickr page if you want, although the resolution of the originals is better. Those eyes are really something! Nice work Mark, thanks for sharing these great images. Very nice work on appealing subjects. The related information is interesting and appreciated. I can imagine, though, that the last image represents some sort of Photoshop masochism--looks like days of tedious work! Beautiful - the eyes look like jewels - and a lovely story. One can share the thrill you must have felt! 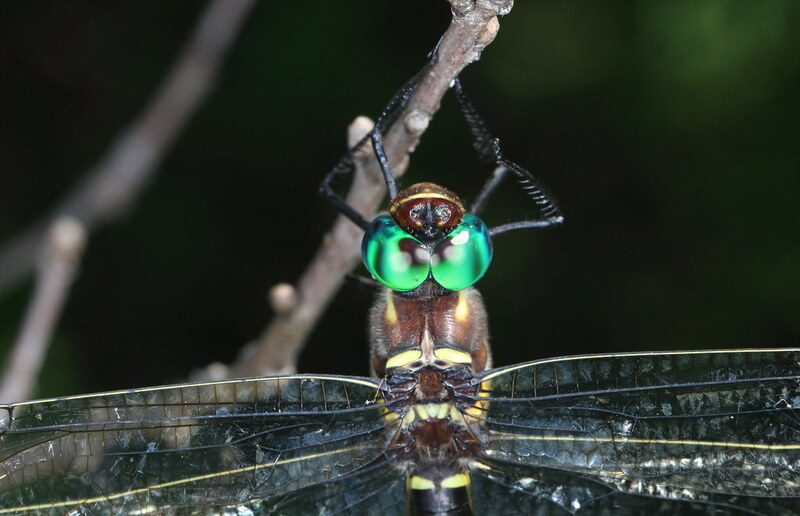 What beautiful dragonflies, wonderful eyes, thank you for sharing. Greetings. Amazing shots for dragonfly. It looks really beautiful.